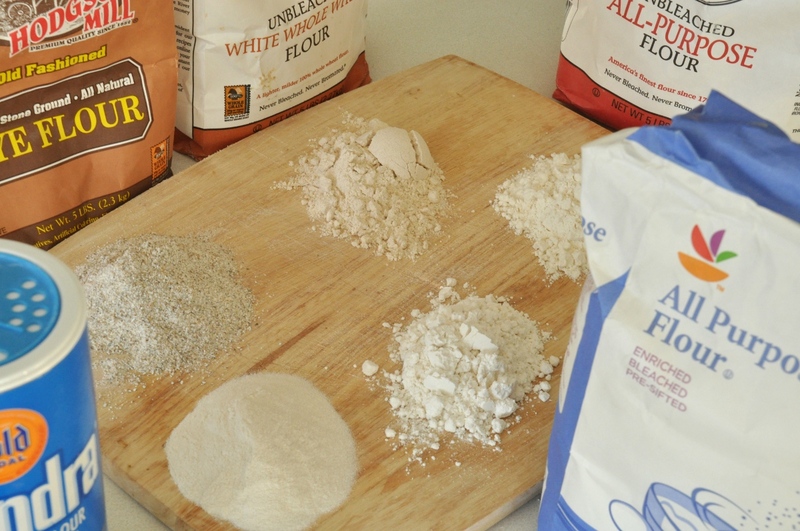 What is the difference between flour types? Flour is a truly amazing substance. It starts off as a simple powder. But as soon as you add water, it turns into an interconnected web of sticky fingers. As you keep mixing it, it becomes less sticky and stiffer to move. Eventually, this gooey mass takes upon shape, is formed into a loaf, and baked in the oven. And out comes out a delicacy full of so many complimenting flavors and delicate texture that is somehow unimaginable to have originated in nothing more basic than this fine dust and water. People have been baking breads for thousands of years. First breads were unleavened – flat breads that were produced by mixing flour with water, flattening the resulting paste down to a disc, and placing it on a flat plate preheated in a fire pit. Only with time did people discover the delicacy of leavened (fermented) breads. The first leavened breads were probably accidents: leavening is produced by yeast, small fungal microorganisms that are present in the environment all around us. Leave some flour out uncovered for few days and it starts fermenting. The same is true with brewing beer. These wild yeasts come from different subspecies and every type produces different flavor chemicals. 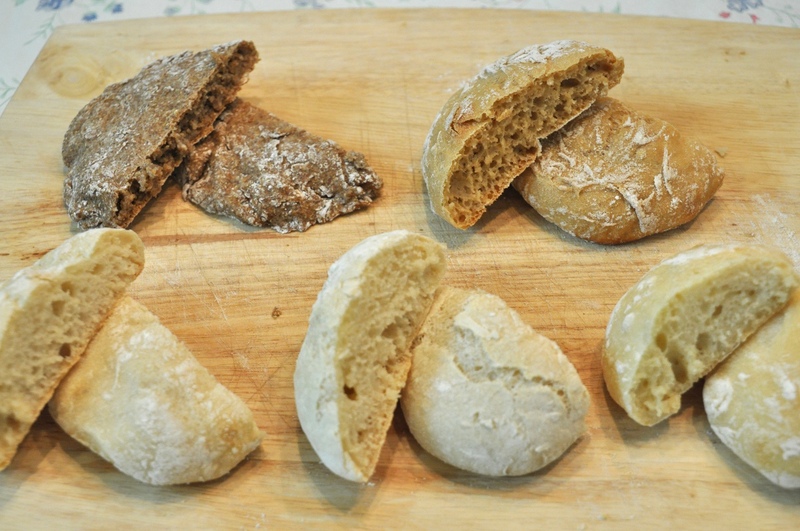 Some are tastier than others, and only through selective process of reusing old bread and saved dough pieces as starters, have people been able to cultivate the delicious bakers and brewers yeast strains now available commercially. In Slovakia, flour is characterized by the coarseness of the grind. 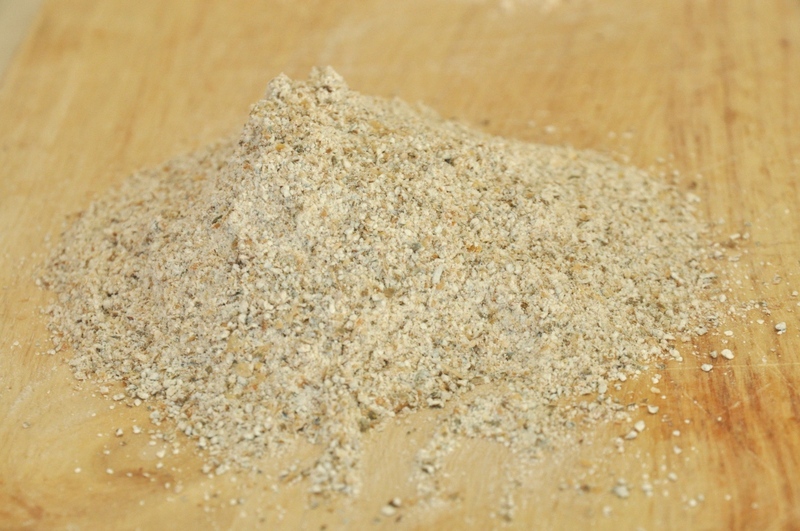 Regular, all-purpose wheat flour comes in three kinds: coarse (hrubá), semi-coarse (polohrubá), and fine (hladká). Here in the US, flour is sold depending on its intended use. There is the all-purpose flour, cake flour and bread flour. These labels indicate the amount of gluten content. Gluten is a protein that makes up only about 30% of flour by weight. However, it is absolutely crucial to baking. 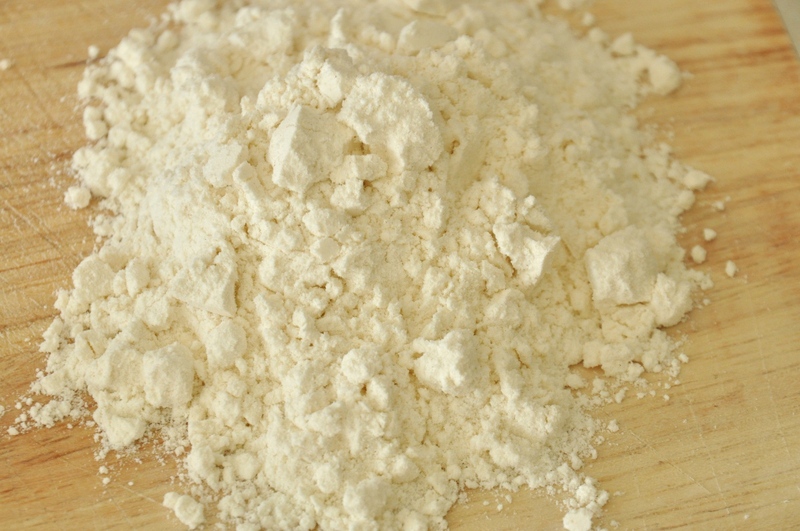 Several different types of flour available in the United States. 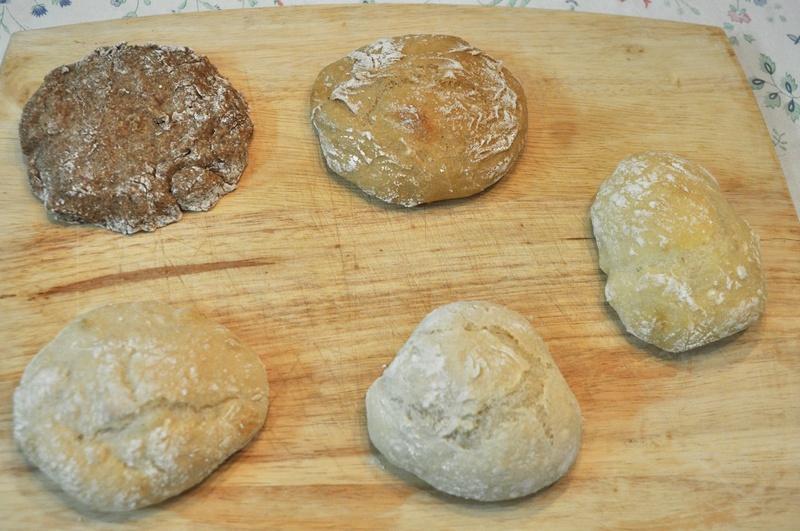 Clockwise from top left we have rye flour, whole wheat flour, unbleached all-purpose, bleached all-purpose flour, and “instant” Wondra flour. Gluten are proteins that link together to form long chains. Think of gluten as small jumbled springs. These springs have hooks on both ends, these are amino acids that form sulfur-sulfur bonds with each other. As the flour is wetted, these springs straighten out and start linking together. The more water is added, the easier it is for gluten to form long chains and the more bread-like the finished product will be. With little water you get crumbly cakes. But water is not the only factor controling the gluten strength. Kneading (repeated folding and flattening of dough) helps elongate the gluten chains, as does salt, which helps prevent charged ends of gluten molecules from repelling each other. On the other hand, fats and oils shorten gluten chains by weakening the bonds and so does acidity (as in sour-dough breads), which increases the concentration of positively charged amino acids that repel each other. The amount of gluten in flour is directly affected by the plant from which the flour is made. In the US, most of the wheat crop is so-called hard wheat, which is higher in gluten than soft wheat. But the main ingredient of flour, by weight, is starch. Starch molecules keep the gluten chains too dispersed to form long chains. This is why cakes, which often contain more sugar than flour, take upon a crumbly appearance. In bread, the starch granules absorb water during baking and form the rigid walls that surround the gas bubbles. Their rigidity helps build up pressure inside the bread, causing the bubbles to pop and find their way out through a maze of interconnected tunnels. In the end, baked bread can be up to 80% empty space by volume. All this empty space is possible thanks to starch providing the structural support. Without the bubbles being able to escape, the bread would collapse after baking finished and the hot steam inside started contracting. As you may know, I am an engineer. This means I find nerdy stuff like comparing different types of flour very fascinating. So I decided to put all this information to practice and figure out what the difference between different types of flour really is. To study the effect of gluten on the finished product correctly, I should have used high-protein, regular, and low-protein flours, such as bread, all-purpose, and cake, respectively. But not having those in my pantry, I instead used the five different kinds of flour I had laying around: rye, whole-wheat, unbleached all purpose, bleached all purpose, and Wondra®. I measured out a quarter cup of each. You can see the closeups above. (This experiment was also the first time I got try out my new Nikon D90 DSLR camera). These are sorted by their coarseness and also the amount of refining. Rye flour is not actually made from wheat – it’s made from rye (d’uh!). I don’t know if every type of rye flour is as coarse as this one from Hodgson Mill, but this flour is distinctly different from the wheat flour. 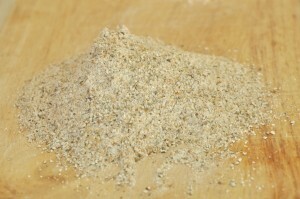 If wheat flour is dust, rye flour is sand. The fines of the grain particles is controlled by the milling process. Milling was such a crucial component of the daily lives of our ancestors, that a mill (mlyn) and the miller (mlynár) appear commonly in traditional Slovak folk tales and traditions. Milling is a process in which the wheat (or rye) kernels are broken up. 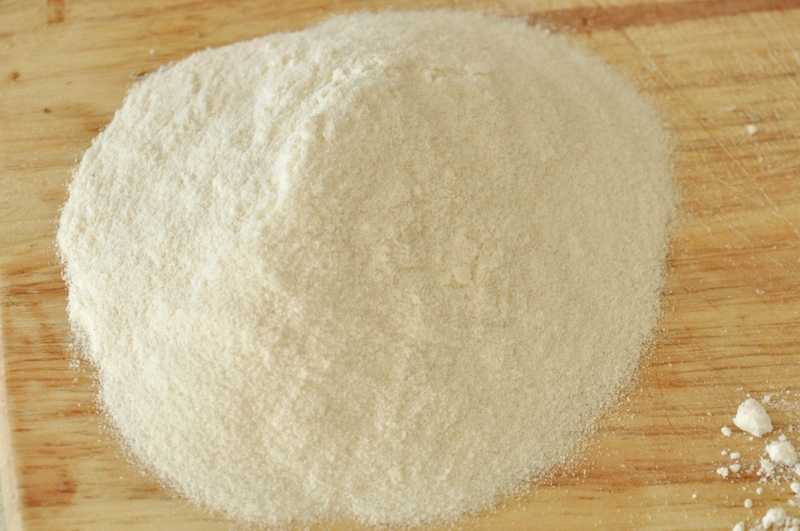 Flour kernel consists of three components: the outer germ and bran layers surround internal endosperm. It is bran and germ that contain much of the flavor and nutrients, but they also have much shorter shelf life than the gluten-rich endosperm. 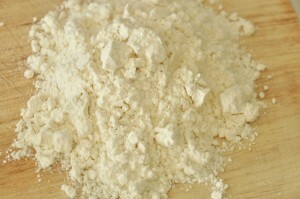 Hence they are removed from much of the flour sold commercially – this is the all-purpose flour. Germ and endosperm also interfere with formation of strong gluten network. This is why whole-wheat flour, flours in which germ and endosperm are retained, result is somewhat denser, less-fluffy breads than those made from white flour. 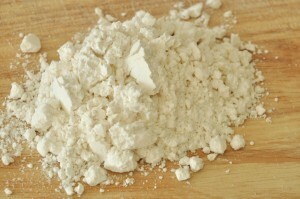 All-purpose flour is known as biela múka, white flour in Slovak. Whole wheat, on the other hand, is čierna múka, black flour, although whole wheat flour is more yellow than black. Another distinguishing mark for the many different types of flour is bleaching. Over the centuries of milling, people realized that bread made from freshly milled flour was not as light and fluffy as one made from flour that had been resting for few weeks. So at the turn of 19th century, flour producers started adding various additives to speed up this natural process chemically. After few chemicals with questionably impact on human health, flour producers settled on ascorbic acid (vitamin C). But these additives took care of only one aspect of natural aging. The other one was that, as flour sits around, it becomes whiter in color. This natural whitening is now replaced using bleaching agents such as peroxide. In my experiment, I used whole wheat flour from King Arthur, unbleached all-purpose flour also from King Arthur, and bleached all-purpose flour from the Giant store brand. I also used some Wondra® flour. Wondra is an interesting idea. It’s an instant low-protein flour that is produced by precooking flour starch granules until they start to gelate. The flour is then dried. This precooking makes it easier for water to penetrate the starch granules during cooking. This kind of flour is well suited for tender pastries or for thickening of sauces. Consistency-wise, Wondra is very fine, dust like. It is similar to touch to the Slovak hladká múka. 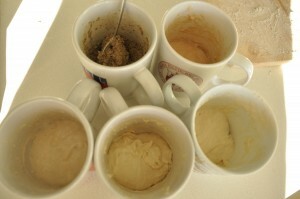 For the experiment, I transfered each flour into a different cup, and added two tablespoons worth of dissolved yeast. Next I added two “shakes” of salt, and enough water to obtain similar consistency from each flour. The sturdier flours needed two tablespoons, the finer ones, less. I mixed everything together, slightly kneaded it in the mug, and then let the mugs ferment for about an hour. The difference between the flours was quite apparent. For one, rye flour is nothing like the remaining kinds. When you mix water into rye flour, you end up with a muddy mess that doesn’t strongly adhere to itself the way dough from wheat flour does. What I found surprising was that, despite all this, the rye flour still ended up rising during the fermentation process. There was also quite a big difference between the King Arthur unbleached and the store-brand bleached all-purpose flour. I didn’t sift either, but the King Arthur flour had much fluffier, almost-as-if-sifted, structure to it. 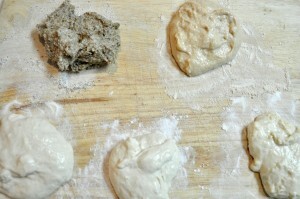 It was much easier to work with and the dough was smoother and silkier. The store-brand flour was, on the other hand, quite clumpy. Here is a “before and after” picture. Before baking and after 20 minutes in the oven. After the flour has risen, I transferred the content of each cup onto a wooden board dusted with the bleached all-purpose flour, and formed each piece into a small loaf. It wasn’t really possible to form the rye dough, so that one remained in a pancake shape. I baked the pieces together in a 400F oven. Long ago, breads used to baked in ovens made of clay, stone, or bricks. The old ovens were shaped as a beehive, and were preheated by setting a fire in them. The fire was let to burn for hours, after which, the ashes were removed, and bread was placed onto the bottom surface. The thick walls helped retain the heat from the fire – the initial baking temperature was in excess of 700F. The temperature decreased with time as the bread continued to bake. But since the surface also became darker, and hence more absorbing of radiation, the heat transfer to the bread itself did not change that much. These days, baking is done at much lower temperatures, and in ovens lined with only thin sheets of metal that do not retain heat for long after the heat source is switched off. In addition, gas ovens are vented to prevent build up of poisonous carbon dioxide – along with the steam that releases from the dough. 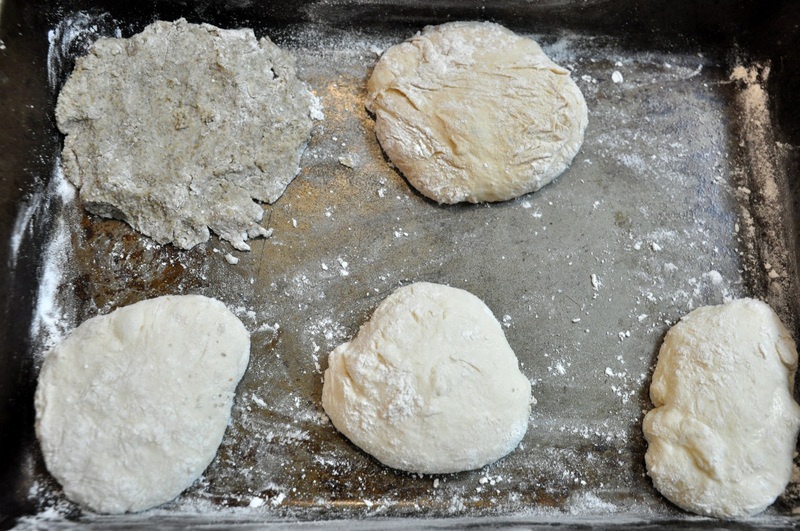 Steam helps to heat the surface of the dough more rapidly – up to four times faster. In addition, steam condensing on the surface of the dough also keeps crust from setting longer, and thus resulting in a larger, fluffier loaf. The dough can expand only until the crust sets. The crust can break if it sets too rapidly before all the gases released during vaporization of alcohols and water in the dough can escape. Water condensing on the surface also gelates starch molecules into a thin film that dries into attractive transparent gloss. This is why home bakers sometimes place ice cubes in the oven with the bread, and why professional bakers have special ovens fitted with steam injectors. Well, I didn’t do any of this, I simply baked my experiment for about 20 minutes. There was quite a difference in both the look and the taste of the resulting loaves! Although the doughs were more-or-less the same color before going into the oven, the difference in the finished loaves was spectacular. The rye loaf was dark in color, hearty, and chewy on the inside. It resembled a big, non-sweet chocolate cookie. The whole-wheat loaf had the beautiful crust of the breads I remember from my childhood in Slovakia. This one was also bit chewy on the inside, and could have used another minute or two of baking. The taste of this loaf was the most what I consider bread-like. Here are loaves made from five different kinds of flour, sliced to show the internal structure. Most of the info on this page came from On Food and Cooking by Harold McGee. This is an absolutely amazing book that you should definitely get if you are interested in the why behind cooking. Thanks for posting the info about the types of flour. I was always wondering about that and also why it is next to impossible to get proper bread in the States. 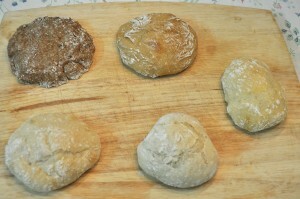 I recently did an experiment here in Kosice with baking bread. I used an American recipe and Slovak flours. The result was ok, but it could use some work. My wife will love your blog when I show it to her since it will make the transition to the US much easier for her(and me)in terms of knowing how to make food using what is available in the US. Wondra is ok to use for knedliky, my wife has used it for decades. But it is expensive and also is sort of artificially made (http://bakingbites.com/2008/05/what-is-wondra-flour/). Recently I discovered the “polohruba”, or semi-coarse, wheat flour in several Polish deli shops; it is called “maka krupczatka”, and can be of various brands from Poland. I buy it at $2/kg, which is fair, anything for the right stuff and better than Wondra. We steam the knedliky (knedle)rather than boil them in H2O, either way they come out and taste as they should! So, check with your local Polish delis. Slanina na oskvarky is called “backfat” or “back fat” (not bacon) and any butcher shop should have it. try to get it as thick as possible to make sure it comes from an older pig, which has better taste. These days mainly young pigs are butchered (2yrs)and the slanina is thin, so look for a private source. After your second paragraph I was think that you must be an engineer – as being one as well it easy to spot. Anyway, this was great information for my wife and I. My wife is from Czech and was always curious about the flour types here in the US – commenting that we don’t have the correct course flours for good bread. We are also always searching for good bread in the local markets. So with such lousy quality I’ve started baking bread and trying to match the good rye she had at home. I’ve be baking bread consistently for about 2 months now and I finally come close to what she would call typicky chleba. At least it’s better than anything local. Wasn’t that nerdy…just very scientific-method like. 🙂 I can understand your wanting to find lots of different types of sausages…it can be difficult to locate them…I have to check out the company you mentioned…Bende. I really dislike “Slovak bacon”. For me, a tiny bit of it on bryndzove halusky or pirohy is ok, but more than that and it is just…blah…way too greasy. Slovak “cookies” can be quite good, but I think I bake better ones (America style). Even most of the Slovaks I know tell me that when they eat them. 🙂 It is normally my only major success in the kitchen. Special thanks for this interesting and enlioghtening article. My frequent guests from Slovakia and Moravia, always complain because we do not have European flour types. I have tried to purchase them from specialty mills but with out success. some like the Italian yellow semolina pasta flour and also the unbleached King Arthur. I have been buying “Bob’s Red Mill”, which they liked, especially the krupica, which seems to be finer the regular cream of wheat. Personally, I do not bake bread and use regular flour for the dough, with great success. I used wondra for many years until the price rose to today’s levels. Your memories of Slovak breads many years ago reminded me of the old days. those huge loaves were so delicious and kept for such a long time without drying out. Of course, I have always been a lover of the crust and my sister and I used to argue over eating the “ends”. During WWII, my father stopped once a week to the Lithuanian bakery in Amsterdam, NY to buy both wheat and rye breads. They made the same as we had in Slovakia. We always had what was termed “Jewish” rye from local bakeries, which we all enjoyed but the ‘Old Country type was the winner. Now in Slovakia, it is mostly like here with the packaged breads that are to soft. The Specialty” breads are overly expensive for me to buy. Thanks again, I will keep this for use when company comes, (like May and July, 2011). Thanks Lubos, that was interesting. If you want some great Old Country bread, it’s incredibly easy. You won’t believe how great and simple this is. For either technique I use bread flour and a couple of TB of rye [or whole wheat flour] and an 18 hour first rise. It’s unbelievable. Hi Lubos, Thank you for this Fascinating Food Blog!!! !I’m Czech and have been in the US with my family since I was 5. 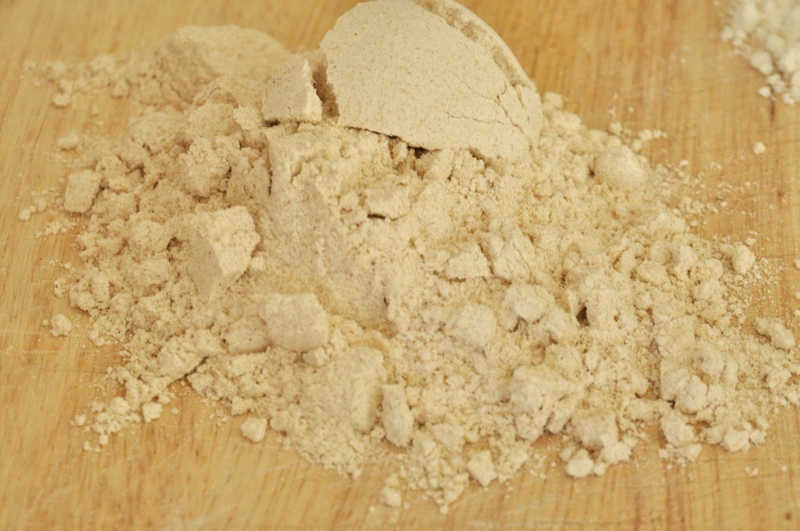 I have been researching flour types so I can make Trubicky(rolled wafers) I have had some success with King Arthur Pastry flour and Cake flour. My family’s “secret recipe” calls for a little bit of hladka mouka bez lepek: fine flour without gluten. All I can find is multi purpose gluten free flour. Do you know of any good substitutes? Thank you for this Fascinating Food Blog!!!! Ahoj Alena and thank you!! I have not tried making oblatky, but I’ve seen few recipes that only call for hladka muka. Here is one (in Slovak) http://varenie.nadhlad.sk/recept.php?r=20_oblatky_alebo_trubicky. I’ll try to make them according the recipe and will let you know how they turn out (or you could let me know if you beat me to it). Thanks again. Great study Lubos, just what an engineer would do! I’m married to an engineer who is now learning how to cook after many years where only I did it. He will not bake, (that’s my domain) and he says from watching me at work that baking requires experience, and especially the “feel” which comes from experience. Your grandma is like mine was, never measured a thing, just went by her considerable experience. I admire the fact that you have the patience to try things out yourself, and work to help those who are trying to duplicate what’s produced in Slovakia. So many different products, so many variables. Any chance you know which kind of US flour would be closest to Slovak “polohruba” flour for baking? I suspect all-purpose. Next time I go to Slovakia I’ll try to bring back some flour to do the US vs. Slovak flour experiment. It’s each perfect situation where there’s not likely each of our pressure meant for him and come within just then start right away,” Elway said. ”He’s not necessarily quite ready for many which experts state. But he’s besides that going returning to learn with Peyton and therefore … I think it’s that great learning feel to produce him on to where we continue to be set with regard to you see, the future. ahoj, takze ked sa v anglickom/americkom recepte pise “self-raising flour”, cim to nahradime my, zijuci na Slovensku? 🙂 polohruba muka a kypriaci prasok? Tak to teda fakt neviem. Ale dobra otazka! Tipujem ale ze to je len muka smiesana bud s drozdim alebo baking powder. All Purpose Flour je obycajna hladka muka. Ja peciem chlieb, rohliky a zemle uz od roku 1989. Polohruba muka sa tu predava vo forme Wondra (modre balenie). Hruba muka sa da nahradit pridanim krupice do Wondry, pomer ale neviem, lebo mam hrubu muku z Ciech. Self-rising flour (aspon tu v USA) sa da spravit primiesanim 1-1/2 tsp (c.l.) baking powder a 1/4 tsp (c.l.) soli do kazdeho cupu hladkej muky (1 cup je zhruba 110g muky (2.37 deci pohar). Je to vlastne Semolina Flour. Thanks for your analysis of flour. I’m from a Czech family but was born and raised in the United States. During my early years, my mother cooked traditional Czech meals for the family. Knedliki (spelling?) are one of the side dishes I enjoyed most, especially with goulash. I should have paid attention in the kitchen in order to better cook Czech cuisine myself. Fortunately, another site https://www.youtube.com/watch?v=9dsMqXOopSY has a the recipe for knedliki and other traditional Czech dishes. However, after I read your study and watched the linked video, I’m unsure which type of flour to use for knedliki. In the video (at 0:25-1:00), the cook indicates, like you did, that the Czech Republic has flour available in different levels of coarseness and that a medium coarseness is ideal for knedliki. She also indicates that medium coarseness is best for knedliki and that in the United States, Wondra flour is a suitable substitute. However, your analysis indicates that Wondra is a fine flour. If that’s the case what flour should I use for knedliki? My first attempt was with Wondra and it turned soggy. The likely cause is my inexperience but I’m also interested in knowing if you recommend another flour that I can purchase in the United States that would work better than Wondra when making knedliki. Any advice you can give is appreciated. We offer opportunity to acquire a plan of 10.000 m with licence approval for a factory for producction of MÚKA a flour made from fish . Nouakchott Maurtitania . I am an American wife of a Czech man living in the US. My husband has translated a number of his mother’s recipes for me. The flour differences were definitely an issue in the beginning. Nowadays, we are very lucky to live about 20 minutes from a Polish deli/shop that actually sells Czech flours (hruba, hladka, and polohruba moukas). That definitely solved the issues completely. We also discovered that all of these flours can be purchased through an online Slovak/Czech store based out of NY. Their website address is http://www.slovczechvar.com. There are plenty of other Czech and Slovak goodies available through that online store, as well. In the very beginning of my 20 year marriage (before the Polish store and/or the online store), I did use the Wondra flour when hruba mouka was called for for knedliky. The results were so-so. After experimentation, I found that using 50% Wondra and 50% unbleached all-purpose flour worked better than 100% Wondra. With that combo the knedliky were almost as good as using real hruba mouka. Of course nowadays with real hruba mouka available to me, I use the real authentic Czech flour. My dad also mixes Wondra to get the consistency just right. Playing around with the ratio each time to find your personal preference is something we highly recommend! I make poppy seed roll every Christmas. 15 years ago I used Wondra flour. Now I use All purpose one. I have followed different recipes for the cakes. 90% of the time roll cracks and the filling oozes out. Recommendations I get: reduce temperature in the oven (I use 325) or use less flour.Any ideas how to get out of this annual troubles. Betka, I have had good luck with this dough recipe for poppy seed rolls. Hope it helps you, too!